In the world of soap making, there are several processes or styles of soap making. There’s melt and pour which uses a pre-made base that you melt and add fragrance and color too. There’s cold process which mixes the melted oils and lye together but doesn’t add any additional heat. The saponification process makes its own “heat” and the soap hardens and saponifies overnight. Then there is hot process soap which mixes the oils and lye – and then adds extra heat to jump start the saponification process and basically “cooks” the soap to completion. Since you add fragrance and additives after the soap has cooked, they do not come in contact with the lye. This can be more gentle on fragile fragrance oils, and can reduce the lye’s effect on botanicals like flower petals and lavender buds which turn brownish black when they contact the lye. The soap has a rougher, more rustic look to it – which can be desirable with some soap recipes. Pioneer soap makers, boiling their soap in big kettles over an open fire were basically doing a hot process soap – cooking the soap in the pot. You can also hot process a batch of soap in the oven. This method uses a crock pot to cook the soap. You can use pretty much any soap recipe to make hot process soap. The only caveat is that you want to use the full amount of water. Since you're going to be cooking the soap, some of the water evaporates, so you don't want to skimp. As with a batch of cold process soap, make your lye solution and then weigh out your hard oils and set them to melting, either in the microwave or on the stovetop. 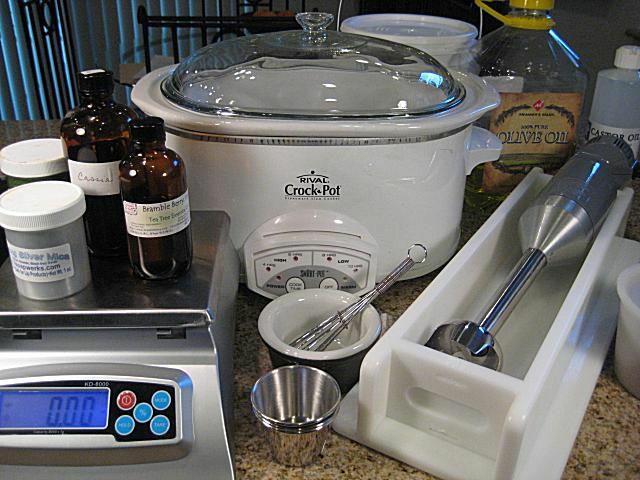 If your crock pot will allow, just put the pot part on the scale and weigh the liquid oils directly into it. Let the melted hard oils cool a bit (to 160 F or so) and then add them to the liquid oils. Since hot process soap has a lumpier more “rustic” look, I wanted to embrace that by adding some rhassoul clay to it. It gives a lovely brown speckle to the soap and is lightly exfoliating. Stick blend it well into the oils. Add your lye solution into the melted oils and blend it as you normally would. The soap will lighten in color quite a bit as it is coming to trace. Once the soap has come to trace, turn the crock pot on “low” and put the lid on. You don’t want a lot of water escaping, so be sure to keep the lid on it! Set the timer for 15 minutes. Once 15 minutes have elapsed, check on the soap. Here you can see it has thickened up considerably – a thick pudding-like consistency. Put the lid back on and set the timer for another 15 minutes. How hot your crock pot cooks on “low” will determine how quickly things will go. Keep checking every 15 minutes or so and stirring the soap to make sure it is heating evenly. What you’re looking for is a darkening around the edges of the soap. It will look more “liquid” and “oily” too. This is the soap beginning to be cooked into a gel stage. Once you see this darkening, the cooking process has started. What you'll have in the batch is a mix of soap in and not in gel stage. Stir the gel stage soap back into the rest of the soap. You want all of the soap to cook evenly. Keep checking on the soap every 15 minutes and stir the batch again. By now, about 45 minutes into the cooking, the soap had reached about 160°. While your soap is cooking, if you’re going to add some colorants, pre-mix them in a bit of olive oil. Because the soap is so thick, you really need to pre-disperse them or else they won’t mix well. Used here are some green oxide and some silver mica. Soap Starting to "Bubble" or "Fluff" or "Rise"
Be on the lookout for the soap starting to “fluff” a bit. The soap expands and becomes a bit lighter and fluffier. It will start to ooze and bubble up at the edges of crockpot. When this starts, you’re nearly done cooking! When you stir the soap and the entire batch is uniformly light and fluffy, it's done cooking. This occurred about 50 minutes into the cooking. Some people describe this as “mashed potatoes” texture – but it may be much lighter than mashed potatoes. It can be like heavy pancake batter – fluffy with a bit of air folded into it. You can test for doneness with a pH strip, or even more reliable is to do a tongue test. If you don’t get any “zap” then your soap is done cooking . If you do get some "zap," then just cook it for another 15 minutes and test again. When it's done, turn the heat off and/or take the crock pot sleeve out of the heating pot. Add your fragrance or essential oil and stir well. It will seem like the fragrance oil is going to make the batch oily or more liquid. Keep stirring. The soap will absorb the fragrance oil and be just fine. Take two pyrex measuring cups or bowls and separate out some of the soap. To that separated soap, add the pre-mixed oxide or mica. Stir it well with a whisk. With the two portions colored, you’re ready to mash the soap into the mold. You can layer the soap any way you like. It's thick and gloppy, so you have to sort of "mash" and "spread" it rather than pour. Then I layered some of the colored soap on top of that, again, pushing it down into the mold as much as possible. I topped off the soap with the last of the uncolored soap. If you want, take a small spatula and swirl/mix the soap in the mold if you like. Cover the soap and set it aside. It will take 24 to 48 hours to cool down and harden enough to unmold and cut. Since the saponification process is complete, the soap is technically ready to use as soon as you cut it, but like cold process soap, it will benefit from a cure ​of a few weeks. You can bevel or trim the irregular tops and sides of the soap if you like. Or you may just want to embrace the thicker, less refined, rustic nature of hot process soap.